22nd January 2019: HE Minister of Environment, Water and Agriculture, Chairman of the Water and Electricity Company, Chairman of the Supervisory Committee for Privatization in the Environment, Water and Agriculture Sectors - Eng. 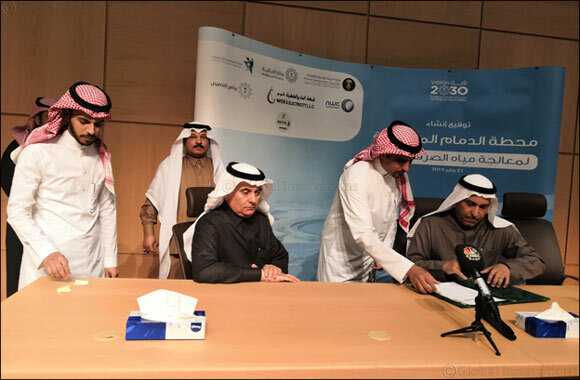 Abdulrahman Al Fadley signed a Sewage Treatment Agreement (STA) for the development of the new wastewater treatment plant in Dammam. The plant has a designed capacity of 350,000 cubic meters per day and an initial capacity of 200,000 cubic meters per day and will serve the western region of Dammam. The project is the first independent sewage treatment plant project (ISTP) to be tendered to investors under a Build- Own- Operate-Transfer (BOOT) model and was awarded to the consortium led by the Metito Group and comprising the companies; “Metito”, “Mowah”, and “Orascom Construction”. HE Eng. Al Fadley explained that signing this agreement is an integral part of the plan set by the Ministry to tender similar projects to the investors in different regions across the Kingdom. This is in line with the Kingdom’s 'Vision 2030' and the wider initiatives approved by the Cabinet of Ministers to further encourage private sector participation in economic development initiatives.